…well, from one angle, certainly. Of course, though, there is much more than that to Raduan Nassar’s story (I hesitate to even stretch to novella; at forty-seven pages of text, some of which are almost blank, I don’t think it quite makes the novella grade). 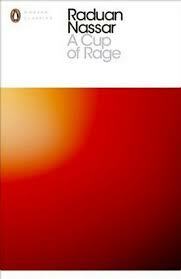 A Cup of Rage is less about what happens, but how it happens, a sparse collection of actions inviting the reader to follow the writer’s long, mesmerising sentences and fill the gaps in later. This arrogance continues throughout the story, leaving the reader to reflect on what his relationship with the younger woman involves, and whether she really is as obsessed with her lover as he seems to think. The structure of the story is notable for its lack of balance, with a few brief chapters, some only a page or so, followed by the lengthy fight scene and one last short section to finish off the book. Each of these chapters, including the main one, is written in one extended sentence, with the only full stops appearing at the end of each part. As you can imagine, this calls for complex, rambling, run-on sentences (with some deft use of punctuation), and Tobler manages this nicely for the most part, with the first sections in particular a joy to read. If you want to look for one, there is almost certainly an allegorical nature to the book too. Quite possibly there’s a political element to the work, or you might just see it as an examination of the age-old battle of the sexes. However you choose to read it, there’s no escaping the fact that it’s a powerful, emotional read, packing a lot into a very short space. Whether you see it as a success or not may just depend on what you want from it, though. Not for me. I suspect that Nassar’s book will be extremely divisive, with supporters passionate in its defence – but not too many of them. I enjoyed the writer’s style to begin with, but as the argument started, and the couple began to exchange barbs, I slowly found myself losing interest. It’s all very well to start the story in media res, and it actually works quite well, but at some point the reader really needs to find a reason to invest in the book – I struggled to find one. I’d also have to say that while I thought the translation was excellent in places, I wasn’t a huge fan of the dialogue. There was a lot of stilted, old-fashioned vocabulary, and the conversation was a bit wooden at times. I suspect that this reflects the original, with the words the man uses being deliberately trite compared to the wave of words swirling around in his head, but if I’m being honest, I’d still have to say that the writer(s) lost my interest well before the end. I doubt it. There are a lot of great books on this longlist, and I can’t see the judges pushing this one into the top six. Someone on the panel obviously likes this a lot and will undoubtedly fight its corner, but I’d be surprised if it got enough support from the panel as a whole to progress further in this year’s prize. I really was not a fan of this one – don’t think it should have been anywhere near the longlist. It’s quite a feat for a 47 page book to get the comment “lost my interest well before the end”. I have got to 10 of the 13 so far (A Whole Life, Man Tiger and Ladivine to come) and this was comfortably my least favourite. The Vegetarian, Death by Water, the Lost Child and Mend the Living are all locks for my personal shortlist. No strong feelings amongst the other 5 at this stage. I don’t think this will make the short list either but I did admire it for standing out – in good ways! The honesty and rawness of the subject matter, and the style – I, too, felt the anachronistic language was intentional but I felt it added to the diatribe. One difference from the other books which didn’t generally exist with the IFFP (as opposed to BTBA which allows dead authors) is the length of time this has taken to be translated.